I attended a cooking demo the other day where they were featuring a “kids in the kitchen” segment. One of the recipes they made was salmon burgers using fresh salmon. It was delicious! I really wanted to try making it but I felt bad taking a beautiful fillet of salmon and butchering it up to make salmon burgers. However, this week at George Brown College we learned how to fillet fish (including salmon). What luck! I scraped the salmon that was left on the bones after filleting them which was more than enough to make salmon burgers. I made salmon burgers two ways – using fresh salmon and canned salmon and brought them to class the following week to have my classmates try in a blind taste test. I have to admit that the fresh salmon patties looked a lot more attractive than the canned salmon (which is why I made it a blind taste test). Much to my classmates’ surprise, most people preferred the taste of the salmon patties made with canned salmon! Canned salmon is usually packed in a salt and water so the patties made with canned salmon were saltier than the ones made with fresh salmon (and as a result, more flavourful). I had added salt to the fresh salmon batch but apparently not enough to make it as flavourful as the canned salmon. Which leads me to the point that at least you can control the amount of salt if you needed to. The fresh salmon patties had a more meaty vs. crumbly texture and also looked more attractive (they had a nice rosy, pink colour compared to the dull, beige colour that the canned salmon had). People preferred the texture of the fresh salmon patties but ultimately chose the canned salmon due to taste. Everyone was surprised that canned salmon ended up being the winner but I was super happy to learn that canned salmon is a quick and easy (not to mention cheaper) alternative. The great thing is that you can just whip it up using pantry items that you have in your cupboard. From a taste, cost and convenience standpoint, canned salmon is a short cut that definitely works in this situation. However, there is definitely a time and place for making salmon burgers using fresh salmon: 1) When appearance matters 2) when you have leftover salmon that you need to use up and 3) when serving kids who might not want to eat a whole piece of fish but are totally fine eating it as a burger. If it gets kids to eat fish, I think the extra cost is definitely worth it. Whisk the egg in a large bowl. Add the salmon, breadcrumbs, shallot, dill, capers, lemon juice and 1 tsp of olive oil. Season with a pinch of salt (omit if using canned salmon) and black pepper. Combine well. 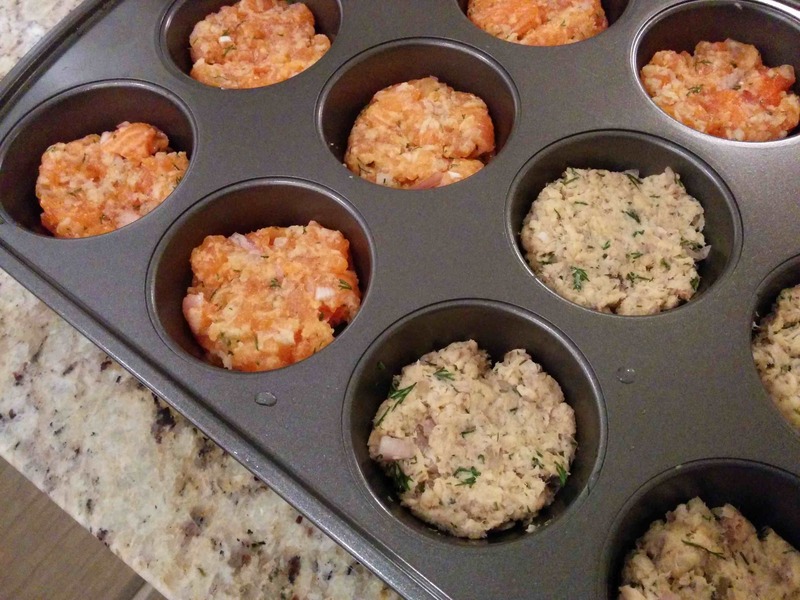 Grease a muffin tin with oil. Form the salmon mixture into 12 golf ball sized patties. Place each patty into a muffin tray and bake in the oven for about 3-5 minutes. Flip the patties and bake for another 3 minutes. Serve in the mini pitas or buns.